Here's a look at the April calendar page. I didn't make very much progress on my to dos this month but it's just like that sometimes. I used clear sticker paper to print and cut the lyrics from Singing in the Rain which is hard to see but it's the words on the bottom left side. 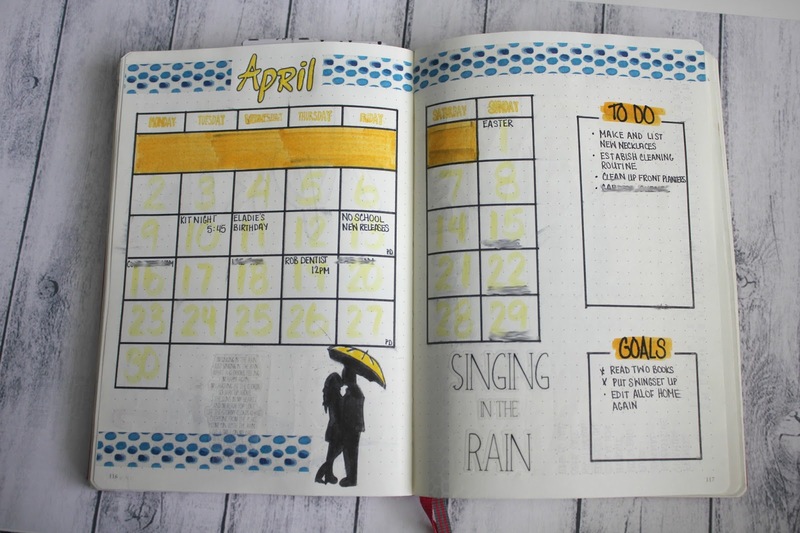 I liked how my yellow themed month came together. 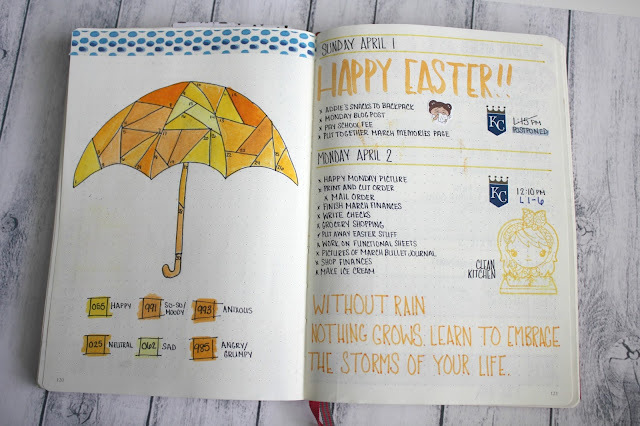 This month it seemed only fitting to use an umbrella as my mood tracker since it was a rainy theme. 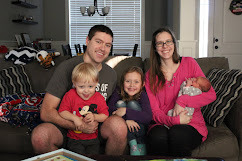 It turned out pretty good all together. 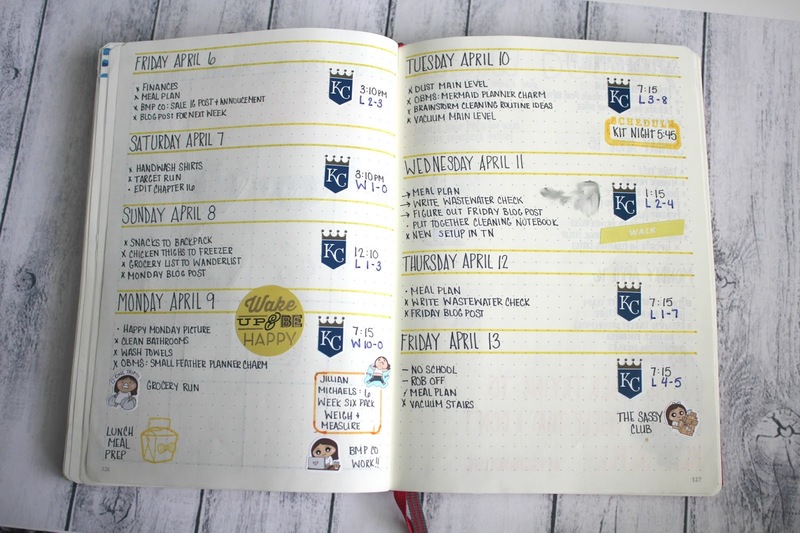 I also used more quotes and stamping this month in general, plus with baseball season in full swing now, I'm back to using my Royals stickers to mark when each game is each day. I tried to do a doodle challenge again but I lost heard towards the end. I just didn't care and just didn't finish. I add this in because I wanted to show that not everything in your bullet journal has to be complete and look awesome. 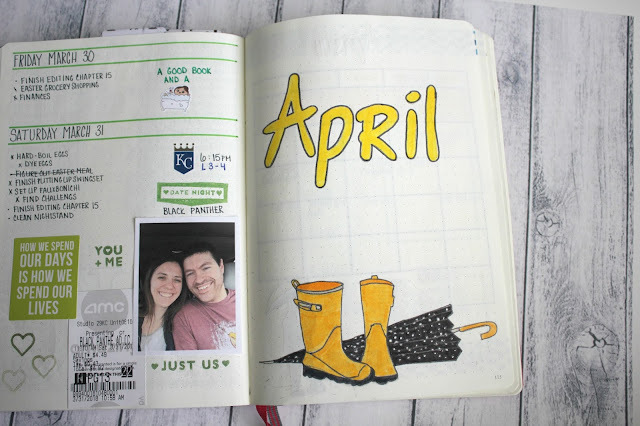 Sometimes they are half-finished like this page. My dailies are much how they were since January. They work for me so you got with what worked. I used some stickers and some stamping. I like how it all comes together. Sometimes you use a quote because it makes you laugh which is exactly what this one did. Because who among us hasn't wanted to sleep just a little longer but our bladder was saying otherwise. Plus who hasn't felt that way especially about a Monday. 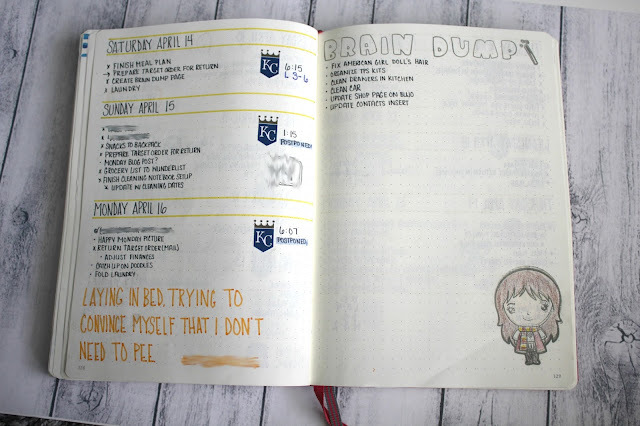 On the flip side though I started a brain dump page. I used stamping for the title and for Hermione, which I didn't do a good job stamping and that totally bummed me out but I colored her in and just had to go with it. For the last couple of days I add in some washi tape and a sticker which seemed fitting. Mostly I add this picture in so you could see the sneak peek of May's theme. Remember how earlier I said April showers bring May showers. So May's theme is flower, mainly tulips since those are my favorite, plus a pink theme. So there you have it. 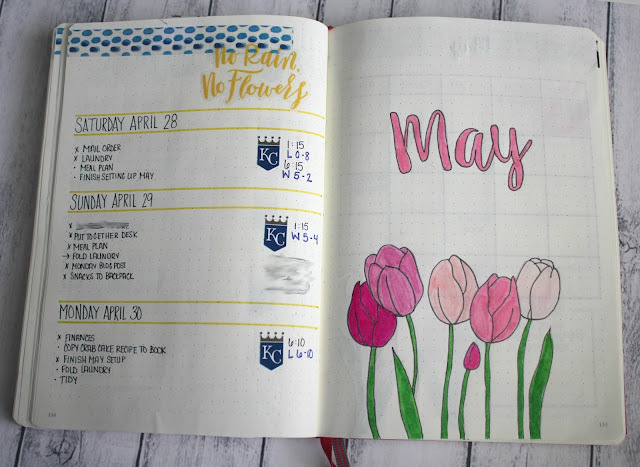 Another month of my bullet journal. 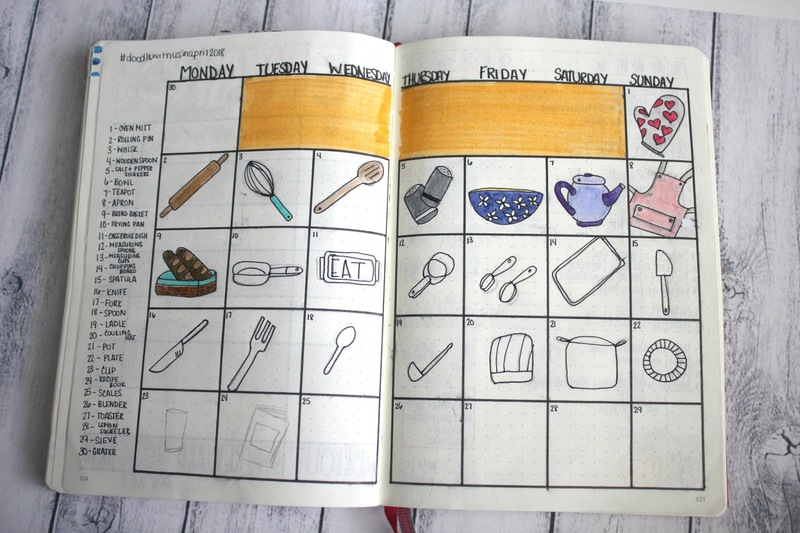 I didn't add in every page because there were a lot of dailies. 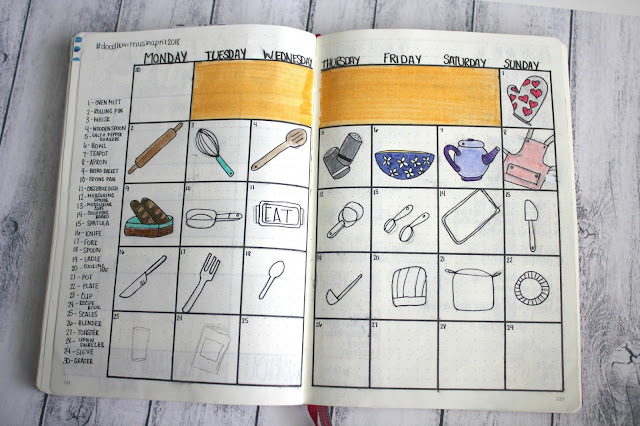 One day I'll share my meal plan notebook since I took it out of my bullet journal. I also have a separate notebook I use for my business stuff since I have a lot to remember and having all things there help me keep my head on straight. I have really enjoyed the combination of stamps and stickers, plus just the good old fashion writing in my bullet journal.